You decided to start a career in tattooing. First of all, you will need a couple of things that are essential for this journey – passion, willingness to invest time and some equipment with tattoo starter kits in it’s center. Fortunately, the initial money investment for the needed tools is reasonable and something everyone can afford. Lets start with the basics – high quality and yet affordable set of tattoo equipment required by everyone to perform elementary tattoo work. 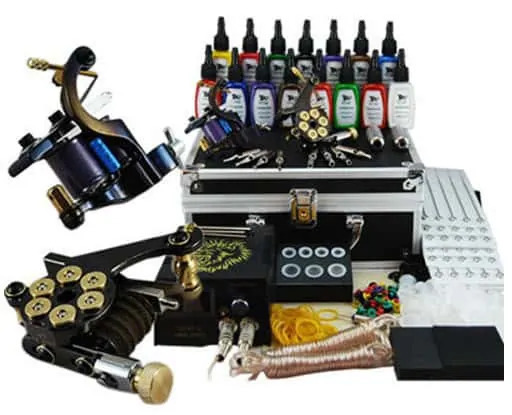 In the next article, we will talk about the different tattoo equipment and gear you need to have to start tattooing, tattoo gun type to apply different tattoo styles, recommended brands for inks, tattoo gun foot pedals, clip cords, tattoo machine holders, power supplies and where to find them in affordable prices with great shipping and quality. So, let’s start. Tattoo machine. One or more depending on the needs of the tattoo work, applying contours (liners and outliners) and at the same time to creating the shadows/shaders, color works and color filling and etc. We recommending the Grinder tattoo set, which is a great tattoo kit. It contains everything you need from tattoo starter kits (power supply, inks, needles, instruction DVD, fake skin to practice on, ink cups and holders and more). Tattoo machine holders. A couple of holders for the tattoo machines, making it possible to take into account the different grips you will use. The tattoo machine holder is a necessary piece of equipment. You will need a few pairs of those because while some will be involved in the work, the rest will be sterilized, which is very important for the safety and hygiene of the process. The main requirement for holders – it’s resistance to oxidation. Therefore, they must be provided with appropriate chemical materials such as: stainless steel, aluminum, titanium or have a special coating and spraying. Tattoo power supply which will allow you fast and simple control of strokes adjustment. Pick one that can be easy cleanable got hygienic needs. Good tattoo power supply will allow your machine to work smoothly without interruptions and fluctuations. Therefore, you better not to use supplies weaker then 1.5 amp. Ideal- supply unit power should be 2 – 3.5 amps. Tattoo gun foot pedal to control the power supply. It’s important part of your tattoo kit, many underestimate it. Iron pedals considered the most reliable, high-quality and durable but today on the modern market there are also models of heavy-duty plastic pedals that much easier to travel with and provide great value for money. Tattoo gun clip cord, one or two, depending on the power supply you use. Tattoo beginners wonder why clip cord supplied and what it’s for. Clip Cord – is the cord connecting the machine to the power supply. I think it is not necessary to explain that the quality and strength of the material from which it is made – is an important component of your kit. The better the material, the better conductivity of the cord. Don’t use the cheapest one. Tattoo inks sets. a set of high quality ink for tattoo of different colors.. Never compromise on those. Use Kuro Sumi for black tattoo ink, and Starbrite / Radiant inks for a colorful tattoo inks. They great. By the way, in the Grinder cheap tattoo kit, they already provided! It’s important to mention that once you purchase a quality tattoo set, it should have everything included. For example, the Grinder set for tattooing, which got all that is needed from a full tattoo kit. Should I Choose My Tattoo Starter Kits By Brand? 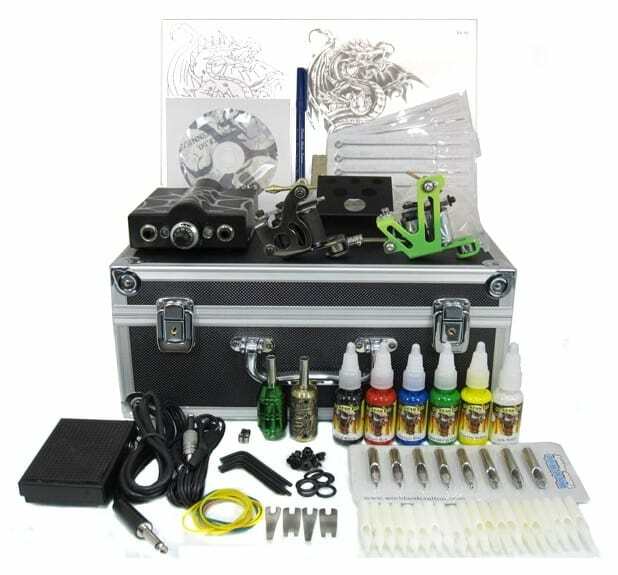 Tattoo starter kits have a variety of packaging, but all of the tattoo equipment mentioned above can be called your permanent, mast-have, static tattoo equipment. Of course, to complete the work you will need additional tattoo supplies. Materials such as tattoo needles, the best tattoo inks you can get, variety of disposable and steel tips for tattoo machines (nozzles), paint caps, anesthetics, antiseptics, permanent tattoo paper for sketches and etc. As for the main equipment, the decisive role of your work quality will play your choice of tattoo machines, the tattoo gun you will use for your work. Remember, the tattoo machine – is primarily a mechanical device and thus the accuracy and quality of his work depends, primarily, on how harmoniously it assembled and the parts construction: springs, coil, contact screws, tubes, needle bar and the like, as well as how the tattoo machine frame designed. Of course, the manufacturer and the tattoo kit brand matters to, but, not so much as the quality of its products. The machine must be, above all, accurate and useful tool in your tattoo art. Apprentice tattoo kit. Got everything you need. The main tattoo machines cab divided into several types, the main three of which are: rotary, induction and pneumatic. Induction (coil) tattoo machines are the most popular and frequently used in design and tattooing. Such machines are versatile and are ideal for drawing contours and create even the most soft shader work. Induction machines has minimum error rate with needle movement and power and amplitude regulation. Also, coil tattoo guns are cheaper then the alternatives. It’s the tattoo gun we recommend for starters. Rotary tattoo machines are the way tattoo guns were made originally. They can be used for lining, shading and filling. They driven by a built-in electric motor and suitable for most standard grips, tubes and needles. They could work nicely as tattoo starter kits but still, we recommending an induction tattoo gun type. Pneumatic tattoo machine can be called “novelty”, as they appeared on the market recently. Their feature -working by supplying pressurized air. They are much lighter and quieter, which certainly makes it easier and more comfortable to work with, but, mush more expensive. We don’t recommend them as a starter tattoo kit (many famous tattoo artists still prefer the coil tattoo gun sets). Tattoo machines for outline works (liner) which responsible to create the outline dominant black line of the tattoo. Those guns have shorter contract circuit (about 1.5mm) that makes the gun to work faster. Machines for filling the tattoo (aka shading/shader) which tend to have a more soft and slower tattoo needle movement. Those can be used for color inks as well. Technically wise, those machines uses larger contact gap than a liner (about 2.5mm–3.5mm). Great, What Tattoo Gun and Kit Should I Pick? To summarize this, we definitely recommend you to pick coil tattoo gun as your start tattoo kit. It will allow you liner tattoo work as well as shader and will be a a great companion to you on your way in the tattoo art world. For specific suggestion, check the Grinder tattoo set review, we highly recommenced it as the best coil tattoo machine price-per-value, or our other tattoo kits reviews that will satisfy your needs. Of course, don’t hesitate to leave us a comment for any question you may have in you journey. Picking the right and the affordable set from all the tattoo starter kits available it’s not an easy tasks but, as we spoke, a great options exist.